Chen Wang Ting 陳王廷 stayed at Yu Dai Shan where he got along with everybody. He got on very well with Jiang Fa 蔣發in particular. They both had a very good level of Kung Fu and whenever they had some spare time Jiang Fa would ask Chen Wang Ting about his Style. Chen Wang Ting told him that he practiced his family style which had been passed down for nine generations. Chen Wang Ting also helped other people in Yu Dai Shan玉帶山, often without being even asked, and so he made many friends and people treated him very well. The rebel leader Li Ji Yu 李際遇, also liked Chen a lot and Chen respected Li greatly as their leader. He found that Li was very smart, fair and cared about everybody, and so created a very good relationship within the group. 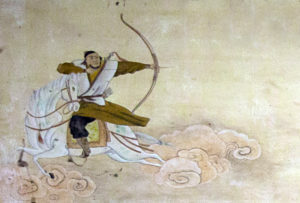 Many times the Ming Army was sent by the government to attack Yu Dai Shan, but each time they failed before even getting close to the rebel’s headquarters. Just Chen Wang Ting on his own could defeat so many soldiers because his archery was so accurate. Whenever he recognised a high ranking officer in the opposing army he would shoot him with an arrow and this created chaos in the enemy soldiers as they did not know what to do without a leader. Eventually Li JI Yu found that the Ming Government was weak, knew Chen Wang Ting would be safe, nobody bother whether he was fugitive or not, so he sent Chen Wang Ting back home to gather more rebel forces to fight against the Ming government.